Cremation Caskets/Containers range from traditional hardwood caskets, such as mahogany and oak, to veneered woods and heavy cardboard. 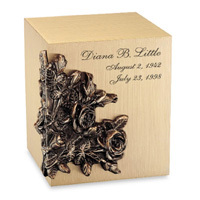 Cremation caskets generally do not have metal parts, such as handles, which one would find on a traditional casket. 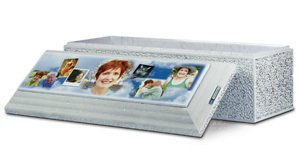 They are used for families wishing to have a traditional funeral followed by cremation. 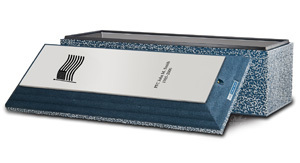 Cremation containers are basic in style and construction and are used for direct cremation. Prices range from $130 to $4,195. Woodlawn has a complete inventory of remembrance items. 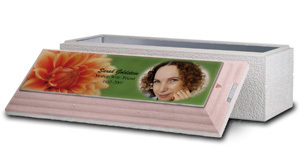 Many items are available for custom order and are engraveable. 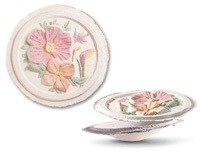 You’ll find everything from 24 Karat gold jewelry to sundial urns for your garden. Pictured below are examples of “thumbies,” our line of fingerprint keepsakes. 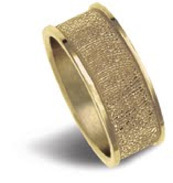 We take the fingerprints of your loved one and are use them to fashion one-of-a-kind jewelry. 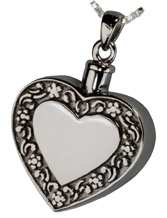 We also carry a wide selection of keepsake jewelry where a small amount of cremated remains or a small lock of hair can be discretely placed inside. Memorial Registry Books. Help record the families and friends who attended the service. Service Folders. 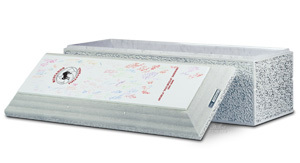 Can provide an outline of the service, clergy, music, pallbearers, pictures, and personalized tributes. Acknowledgment Cards. Thanks those who offered their condolences and help when it is too hard to say thank you in person. Prayer Cards. Offered in many different styles (religious, nature series, military) and may incorporate a personal photograph, and any prayer or personal verse. Floral Tributes. Woodlawn’s staff can assist with floral tributes from family and friends. 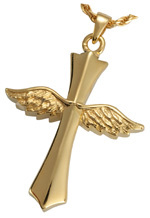 A wide variety of selections are available that can be displayed at the service, ceremony or visitation.